Get ready to level up for a race through 8-bit adventure on this special edition of Hot Wheels Track Wars: Super Mario Bros.! We always need to find the fastest way to the finish line. But what if there's a mega-monster in the way? Or an old lunch lady? 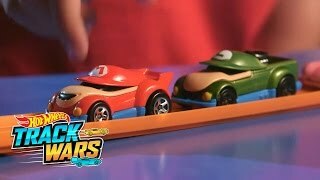 Let's see who build the fastest track and chooses the fastest car to get to the end! Crossover between 2 of my favorite things in the world! Is the girl from stuck in the middle?? Ohhhhhh yeahhhhhhhhhhhhhhh!!!!! This is AWESOME!!!! !